Omega House v Bukurešť, Rumunsko: Zarezervujte nyní! 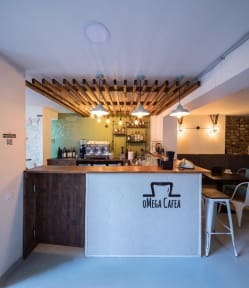 Omega House is a co-living & co-working space - a unique concept in Romania that holds under the same roof private and shared rooms, a cafe, a hub and an unconventional events space. A place where you can move in entirely and have all your working and living needs meet, or you can enjoy each of the separate services we offer without actually moving in and still enjoy the vibrant community at each visit. You are welcomed to co-live with us either in the private rooms, or in the shared ones. Or you can choose to spend a night or two in out Boutique Hotel or in one of the dorms. You keep hearing this name and have no idea what it means? Well, it’s the new way of living cleverly. Imagine you are living in a house where you have your own room and personal things, a very cozy and generous lounge, a fully equipped kitchen, 2 terraces, a cafe, an out of the box coworking space and access to networking, social and educational events. Coliving is for those who understand that HOME is more than the place you sleep in. It’s for those who like being connected with high quality people and still have privacy, who hate wasting time in traffic, who build their lifestyle on values like freedom, diversity, innovation. Whether you are an entrepreneur, digital nomad or you just like doing things in a different way and have an insights on the way the world moves, Omega House is for you. You’ll find here everything you need to give life to your ideas, connect with great people, relax, grow. 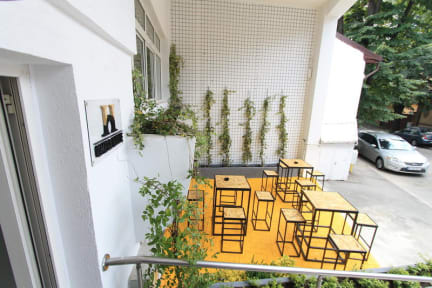 Opening the white front door, you are welcomed by jazz tunes and freshly grinned coffee, which you can take to go or serve it in the cozy cafe! If you’re looking for a way to spend your free time, our library has a selection of over 3000 titles. Personal development, fiction, history... you can take your pick! The Music Hub is our largest hall - a lounge and events’ space. It has its own interior terrace and direct access to a fully equipped kitchen. We have also thought about you guys, the ones that like to work in a silent and cosy place. Our Quiet Hub has plenty of natural light, a separate meeting room, and two relaxing areas. The following is our house policies and conditions : Check in from 14:00 to 24.00 ; Check out before 12:00. Cancellation policy is 48 hours prior first night of arrival and please make your payment upon arrival by either cash, credit card or debt card and this property may pre-authorise your credit card. Please be advice that breakfast is not included. Our reception opens 7 days a week so please don't hesitate to come and speak to us with any questions and concerns.